Kreative Kangaroos must be four years old by September 1, 2019 and will be entering a PK program in the Fall 2019. The Kreative Kangaroo program is one six-week session offered from June 24 - August 2, 2019. Passport to Fun Week is available August 5 - 9, 2019. Campers must be toilet trained prior to starting camp. To promote a nurturing environment, we keep the activity groups small—typically six children. Campers are introduced to the wonders of summer camp. The camp day is a creative mix of indoor and outdoor activities and a balance of free choice and structured time. During the morning each camper fills his/her activity period with an activity available in the classroom or one from a Special Subject. 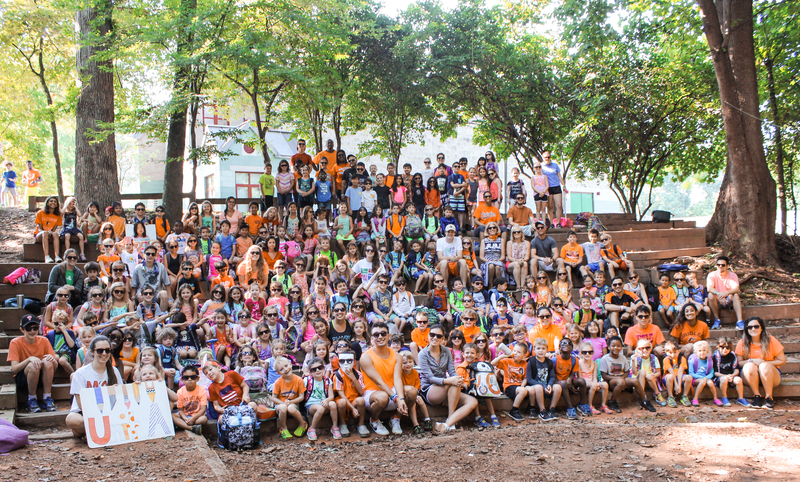 Each week features a different theme (Sports, Under the Sea, Outer Space, etc) and campers rotate through four theme related activities which change each week with the new theme. Campers have instructional swim in the camp pool five days a week. Our certified instructors accommodate each camper based on his/her level of comfort in the water. The Unit is led by a Unit Leader with a Head Counselor, one counselor, one CIT, and one student service learning counselor assisting. A counselor will accompany his/her group throughout the camp morning to ensure continuity for the children. Campers bring a lunch daily; a healthy snack, milk, and water are provided. The lunches are not refrigerated. We also offer hot and cold lunch selections delivered to camp through the Smart Lunches program at www.smartlunches.com. Kangaroos swim five times a week. We have a pool on campus with a beach entrance which is useful for young swimmers. We use a Red Cross certified instruction program which we supplement with Mr. Blue songs and pool teaching aids developed by Julie Gross, a certified water safety instructor and elementary school teacher. For more information, please visit Lessons With Julie. Because we want children to develop a love of swimming, we do not force children to do anything other than to dress in their bathing suits and come to the pool. Three weeks into camp, the campers are divided into smaller instructional swimming groups. Counselors are in the pool assisting the swim staff which helps to keep the teaching groups small. Our youngest scientists start each lesson with a question such as “What happens when you mix baking soda and vinegar?” and then enjoy exploring the answer with an active study of chemistry based experiments. Other explorations include studying weight, hearing, air and bubbles, taking nature walks, and learning about birds and snakes. 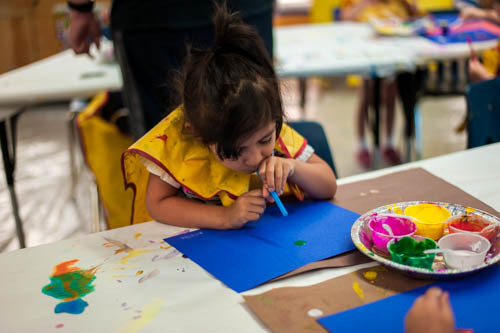 Finger painting giant fish, making paper puppets, working with playdough,decorating foam crowns, creating a coral reef collage, and string painting are just a few of the activities going on in the art room. After completing their daily project, the campers are free to explore activities in watercolors, drawing, stencils, and beading. Campers learn to hammer and nail as well as drill and screw safely using foam and then move on to creating, decorating, and painting wood items such as door hangers, bobble heart note holders, bead bracelets, and craft stick people. Campers have fun and develop athletic skills through many different kinds of team games and activities. Organized sports games during the Specials period will be a team sports (i.e. t-ball or soccer). Before each game, campers will participate in short drills to practice basic skills like dribbling, catching and throwing. Green Acres favorites like freeze tag, parachute games, balloon relay races, and gaga will continue to be offered as Choice Time activities in the afternoon. Campers embark on a musical journey into exploring rhythm and melody and creating new songs of their own. We start by learning to sing and move to a song, and then isolate specific parts to use in creating new compositions of our own. Campers enjoy creating rhythms to play with different instruments and making their own melody patterns. Campers have fun playing new rhythms on different instruments and forming a band with overlapping rhythms. On the rhythmic front, campers used three different percussion instruments in groups to create a rhythm ensemble that included different patterns that all fit together into a unified whole. Being part of a group like this is a wonderful way to experience the music and see how each member adds to the whole! The Kreative Kangaroo room opens right onto a playground featuring a large sandbox, a ship to climb on, and extensive play areas with swings, several play houses, and numerous climbing structures and slides. It is shaded, too! Weekly assemblies are very popular at Green Acres. Shows featuring singing puppets, dog tricks, reptiles, and storytellers were a big hit last summer. We also have a 4th of July Parade and Fun Run, Fun Fridays, Spirit Days, a Staff Vaudeville Show, and a Special Day.